Hi Everyone, we've been trying to catch up on blogs this morning because we've been very busy! We've visited our friend Millie. 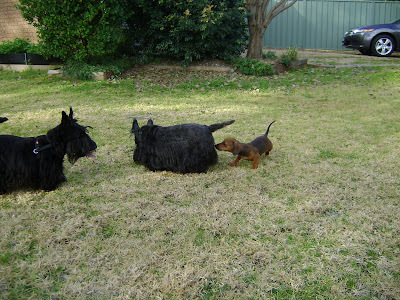 Poor Kendra didn't have much of a chance fetching the ball with that whirlwind Millie as competiton. Millie is crazy wild.....but loads of fun! Gwen is a retired Champion Bull Terrier. She's the mother of champions, too. She is a very happy and gentle lady--even when Bella bedevils her. But, you know what? Other people are afraid of her and won't let their dogs play with her. Just because of her looks! And Gwen loves everyone......even cats! because she wanted some possum recipes!!!!! BOL!!! Bella and Daisy enjoy walking along the 'beach' after a dip. And before you ask-- it was worth a bath. Hi Everyone, Today was ANZAC Day. ANZAC stands for the Australian and New Zealand Army Corp. Every year on April 25, Australia and NZ have their day of rememberance of all the service men and women who have given their lives.....and/or served our countries in war. In addition to dawn services and parades in nearly every town in Australia, there were dawn services at ANZAC cove Gallipoli (where it all began), Villers-Bretonneux, France and Long Tan, Vietnam. It is not a glorification of war, but rather just a time to reflect, and remember those who have had to fight. 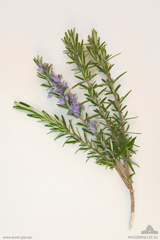 Rosemary is worn in rememberance. Kendra and Bella waiting to eat their eggs and Hot Cross Buns. After our early morning walk, we sat outside to eat our Easter goodies. We had a taste of the Hot Cross Buns and loved them. 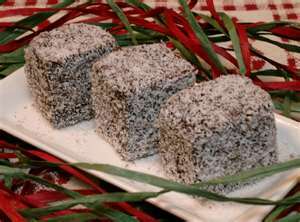 SHE bought the children's kind, they have no dried fruit in them. While SHE was taking the shells off the eggs, Bella kept trying to steal a bun. Took a few attempts, but she managed to make off with one. Bella makes short work of the egg. Then we ate the eggs. Daisy realised she was missing out on food and finally came out to be photographed and join in the fun. Ahhhhh, what a wonderful day! We ran off in three directions when we got our bones, so we could eat in peace. And we're always together because SHE makes us. 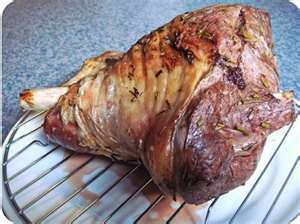 FIRSTLY.........a roast leg of lamb! That's for those in Blogville who have big appetites! 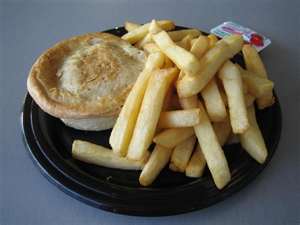 And a meat pies with chips. 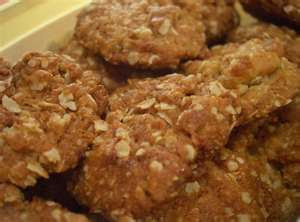 Some ANZAC biscuits (cookies) because tomorrow is ANZAC Day. We'll be drinking some Passiona.......yeah it's a soft drink, but we'll use it as a mixer. Happy Birthday Ronnii! Now, who wants to dance? 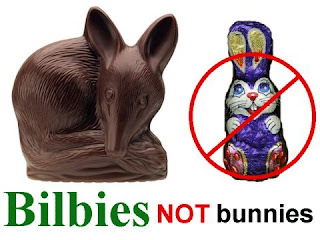 As you may or may not know, bunnies in Australia are feral. They were introduced for hunting purposes....sport and food. Well, they took over the continent causing major damage to the environment: eating the grass and plants needed by domestic and native animals as well. There was also loss of plant species which led to erosion. 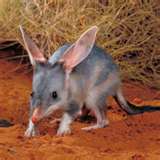 Well, the Bilby is fighting back! At Easter, if you buy chocolate bilbies, a donation is made by the chocolate makers to help save the bilbies. So we're doing our part--even though we can't eat the chocolate. 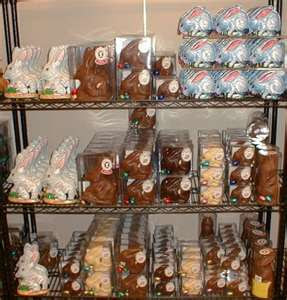 We hope you have a very Happy Easter (if you celebrate it) or a Happy Weekend. 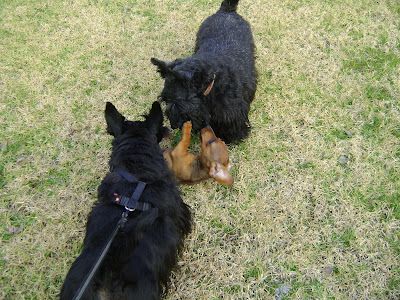 Remember our little friend Millie? She's celebrating her First birthday this month. Well, just look at her now! She is the boss of her household. A typical doxie. And she's still a lot of fun to play with. After the snake incident, SHE decided we'd go to the dog park. Kendra ambles along and sniffs everything. Bella and I just run around her (Kendra). We check out the drains. We don't really care where we walk........we just like getting out! We didn't tell HER that there could have been snakes there, too. SHE nearly let me, Daisy, run free; but there were a lot of men mowing, whipper snippering and leaf blowing. The 'Catheads on Footpath' sign was back. We didn't see any cat heads though. And the men stopped all their noisy motors when we walked passed, which was nice. 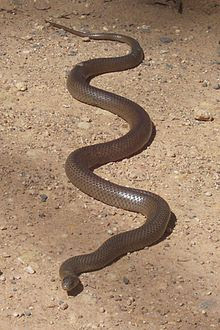 Then suddenly, there it was..............a huge SNAKE......the first we've ever seen! SHE would have missed it, but Bella and I were on the job and chased that slithering thing. We might have got it if SHE hadn't put the brakes on our leads and yelled 'NO!!! BAD!!!! an Eastern Red-bellied Black. All she saw was the last metre of it disappearing into the ravine at about 87 thousand miles/hr. On the way back, we warned the workmen to be careful. Some of you may remember our friend Marli the labradoodle. Sadly, Marli ran across the road to see a friend and was hit by a car. She's gone over the Bridge. We will miss Marli--a great zoomies and bitey face player. ﻿Today we celebrated Bella's second birthday. This is her birthday cake. Kendra and I posed for the camera so we could get the photo shoot overwith quickly. The cake was rescued and taken outside, so we could each enjoy our lambshanks! Yes, today is her birthday--April 11th. Because we were camping while SHE went to Sydney, we haven't had a celebration yet. But Bella is so excited to be home again, and having lots of cuddles, she's happy to celebrate tomorrow.